I also ran this system with one First Watt J2 amp, thus eliminating the RCA splitter, and the pair of Clarity Organic interconnects as well. The result was perhaps a touch cleaner, but the overall visceral impact increase, the flooding of the soundstage with more depth and information, tidying up the bass, etc. weighed heavily in favor of the passive vertical biamp configuration. I found the Verastarr to be capable of bringing out a more luminous sound from both DACs and amps than I recall hearing from such brands as Wireworld and Tara Labs. Mike won’t tell what precisely is inside a Verastarr power cord, but the flat conductor seems to carry more refinement with the signal than I recall the Magnan Cables having. The large flat cable for the Verastarr Grand Illusion 2 bends easily enough in two dimensions, up and down, but offers more resistance when being twisted around for insertion into an IEC socket on a component. One other potential placement pitfall awaits users, as the Grand Illusion 2’s flared collar leading from the plug to the wide-bodied conductor may intrude upon placement of other power cords next to the Grand Illusion. There is little horizontal space to wiggle in power cords from an angle close by the Grand Illusion 2, if necessary. It seems that it would be impossible to place two Grand Illusion power cords next to each other side by side. This is not a minor consideration, as often outlets are ganged in listening rooms. Owners may have to stagger the Verastarr power cords or place them “stacked”, one on top of the other in a duplex outlet if placing them into a four or more ganged outlet box. Verastarr Cables were the ones I chose to pair with the incomparable TEO Audio Liquid Cables for my reference systems. Solid conductor cables seem to carry an electronic ennui compared to the TEO. However, the Verastarr bore less listlessness than others such as Silnote Audio and Clarity Cables. I have a new reference system that is quite a departure from the ones I have assembled for some time. Often, I have used a dedicated preamp and separate DAC, mated to either a robust tube amplifier or hefty solid-state design. In a dramatic turn, I now have an integrated DAC, the Exogal Comet, mated directly to a pair of stereo class D amps in mono mode, the Red Dragon S500. The RCA interconnects are by TEO Audio and the speaker cables are TEO’s Standard Liquid model. I am getting terrifically relaxed and rich sound from these components. The Exogal Comet is a refreshing take on digital-to-analogue signal treatment. This DAC is exquisitely sensitive to cables, and the precision of the Verastarr Grand Illusion 2 extended the voluminous soundstage rendered by the Exogal Comet and its upgrade power supply. In comparison to the Clarity Cable Vortex Power Cord, the Verastarr Grand Illusion 2 had more lightness on the top end, but a touch less bass fullness and impact. I found similar results when I compared the Vortex to the Grand Illusion 2 on my pair of Red Dragon S500 amplifiers. Running the Red Dragons in Mono mode, I switched between these power cords and found the Grand Illusion 2 more vibrant and illuminated, but the Vortex having more bottom-end presence. Conversely, Silnote Audio’s Poseidon GS was brighter and a touch more detailed than the Grand Illusion 2, but seemed tipped up. With a concentric speaker like the PureAudioProject TB15, under review, the Poseidon GS seemed to deliver a bit too much upper-end energy. Female vocalists such as Christina Aguilera’s collaboration with Herbie Hancock, singing, “A Song For You,” lacked upper midrange presence, which the Grand Illusion 2 added. I have tried many USB cables in my systems and had settled on the Clarity Cable Organic USB as my regular link for file playback. Yet, with the arrival of the Exogal Comet I was met with a conundrum. The Clarity Cable Organic USB simply would not pass a signal to the Comet. After hours of fruitless labor I gave up. I thought I would try the Verastarr Nemesis USB as a backup. I had relished the lush sound quality of the Clarity Cable; Aguilera’s voice now was touched by a sweetness heretofore lacking. Over the weeks the Verastarr Nemesis USB has become, to me, a premier cable, having used it successfully with the Legacy Audio Whisper DSW Clarity Edition speakers, Kingsound King III electrostatic speakers and the just received Joule White 3. It is superbly clean and with a fullness not achieved in over a dozen other USB cables I have tried. It is an easy recommendation at a reachable price point for those interested in no-compromise digital performance. Perhaps down the road I can add the Verastarr interconnects to my exploration of this fine, flat-conductor brand. The Verastarr Nemesis USB is a prizewinner, perhaps the finest performance for the dollar in the Verastarr lineup. It should be on short list of USB cable comparisons. The Grand Illusion 2 power cords are superb for use in a variety of applications including DACs and amplifiers. As the strange coincidence of TEO Audio not making a USB cable or power cord, and Verastarr not sending me interconnects, I can only ultimately conclude that they are a fine mixed cable set, fit for premium systems. 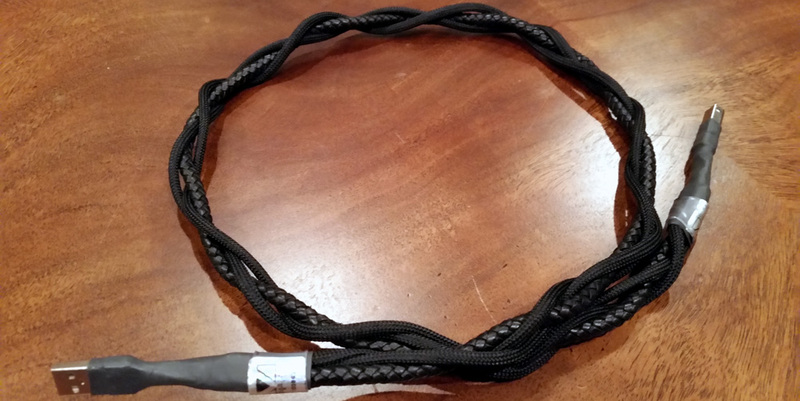 The Verastarr line provides real world audiophiles an alternative to the cost-no-object TEO Cables. Thank you for the review. In the paragraph where Doug wrote that I wouldn’t tell the magic tweak inside the cable, I actually will, just won’t talk about the exact specifications of our foils. Our high purity silver or copper foils that have an exclusive treatment done to them which is trade secret. We know cryo is part of that. Furthermore, Verastarr uses its own blend of Piezoelectric and Paramagnetic minerals in a polymer matrix in the cable ends. In addition, there are special resonating wafers in between the foils that along with the minerals are said to cause passive noise reduction. Doug also talks how the cables bend in 2 ways, this means they can fold over in a 90 degree angle upon themselves for a downward bend if the cord is vertically mounted. Also the “flare” part of the cable neck is flexible enough that when you put them side by side you can flex them one over the other to fit with no issue. Douglas – which USB cables (the best of the dozen you alluded to) were bested by the Verastarr? The two low cost offerings, one from Furutech and the other from Pangea, compared quite poorly. The Einklein and WireWorld were very good, but not as capable. The second best imo was the Clarity Cable prototype which has now been superseded by a newer model, which I have not yet heard.